The fact that you're on this site and reading this review assumes you're of a certain musical disposition, and if you are in any way interested in the more beautiful things in life, the sensitive yet experimental end of modern music - pay close attention as this album is just about as good as it gets. I first heard "Cendre" a few weeks back and it blew me away instantly. Christian Fennesz and Sakamoto working on a full album together? Yes, and rather than go down the route of their previous short-form collaboration 'Sala Saint Cecilia' (which was drifting and sometimes impenetrable), "Cendre" is an album focused on layered harmonies and simplicity. 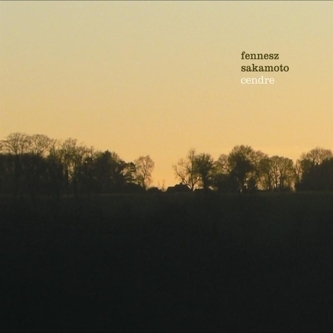 Taking Sakamoto's signature piano work (think 'Merry Christmas Mr. Lawrence' and you're on the right track) and classic Fennesz production ('Endless Summer', 'Venice', '"Plays") 'Cendre' feels like the perfect meeting of minds - and while it might be obvious to reference Sakamoto's high-profile collaborative work with Carsten Nicolai, these two musicians seem much more evenly matched. Sakamoto's haunting motifs may be wrapped up in sheets of harmonic noise, but they never become overwhelming - rather this is an album which revolves around subtlety and attention to detail. The emphasis here is on an almost Zen-like calmness and the restraint around which the two have balanced the album is just hard to fathom. It's the sort of record that can change your mood, but without resorting to cliché or emphasis on 'ambience'; it is optimistic and life-affirming but never over-wraught, I wouldn't even say that it is sentimental. Cendre, rather, is an album that you can imagine piecing together your own stories to, an album which is primed for you to remember ten or twenty years down the line, leaving you with that nameless, warm, fuzzy nostalgia and a heavy heart. I don't even think I need to mention Eno or Harold Budd do I? Absolutely gorgeous, and without a doubt one of the finest, loveliest records you'll hear this year. ESSENTIAL PURCHASE.